Consultant Transfusion Medicine, Govt. Medical College, Chandigarh. Member National Blood Transfusion Council & National AIDS Control Org. Dr. J. G. Jolly former professor of the Blood Transfusion, Department at the Post Graduate Institute of Medical Education and Research, Chandigarh is an internationally known pioneer in the field of blood transfusion. Over the past 40 years his dedicated work has contributed magnificently to the development and excellence in professional service, research and teaching in the field of Transfusion Medicine in India. On the completion of his assignment at the PGI, Chandigarh he joined SGPHI Lucknow to establish a department of excellence where he introduced postgraduate Degrees in Transfusion Medicine for the first time in the Country. 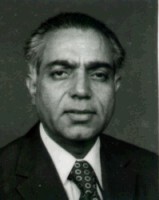 Among the numerous distinctions conferred on Dr. Jolly where J. G. Mukherjee gold medal by the Lucknow University for distinguished research contribution (1958), B. C. Roy National Award for the development of the speciality of Blood Transfusion in India (1981), Philip Levine Memorial Award for national contributions in Transfusion Medicine (1993) and IDPL Diamond Jubilee IMA Oration Award (1996). The fact that the speciality of blood transfusion has begun to be recognised in India can be attributed to the sustained effort of Dr. Jolly. He has been accorded recognition by the International Agencies like W.H.O., International Society of Blood Transfusion and World Federation of Haemophilia. He has been the founder of Blood Bank Society, Chandigarh, founder President of Indian Society of Blood Transfusion and Immunohaematology and made significant contributions in the Development of Blood programme in the country. As a result of his contributions he has represented the country in numerous International Delegations as well as scientific conferences. During the course of these visits he could get an opportunity of studying the blood transfusion programme in different parts of the world for revamping the organisational set up in India. The Ministry of Health, Govt. of India, WHO, ICMR and various other National Institutions have accorded due recognition for his expertise in revamping the organisational structure as well as academic and research activities in Transfusion Medicine. His appointment as the Chairman of the expert committee on blood transfusion, WHO consultant for the improvement of blood programme in Delhi, member of various committee of the National AIDS control organisation, Chairman of the Blood Transfusion Committee of NACO and member National Blood Transfusion council are note worthy. He has contributed over 100 articles in the leading journals and presented over 150 papers at the National and International conferences. During the recent years he has been concentrating his activities primarily for the academic developments of transfusion medicine. Being associated with the National and State Blood Transfusion Councils of Punjab, Haryana and Chandigarh he continued his efforts in the development of Transfusion services in the region. Organisation of Post Graduate Training Programme in Transfusion Medicine, preparing a plan of action for technical resource group, constituted by the Government of India and a regional symposium for the northern states were the prime activities conducted for PGI, Chandigarh. He was also instrumental in setting up a department of Transfusion Medicine having well established unit for blood components at the newly established Govt. Medical College, Chandigarh. As a result of his innumerable contributions in this field Dr. Jolly is being recognised as the leader of blood banking in the country and is being associated with leading transfusion centers in the country as an advisor.